Are you looking for a reputable, professional and fully licensed waste removal and rubbish clearance service in Stoke Newington or Stamford Hill to deal with all of your waste removal needs? Look no further than Away With It! We have been providing waste removal and rubbish clearance services to the N16 area for more than 10 years, and over that time have built up a reputation for providing an efficient, prompt and affordable service for all of our clients. Whether you need to clear a couple of rooms or are after a contractual commercial waste collection – or of course anything in between – you can rest assured that Away With It has all the tools you need to get the job done. We operate from 7:30am – 11:30pm 7 days a week, and it is a same day service! As we book in two-hour slots, you won’t be left hanging around all day waiting for us to arrive. We are fully transparent, and you will receive a no-obligation estimate before we begin any job. You only pay for the space in our truck you actually fill – a fair price is guaranteed no matter how big or small the job in hand. As fully licensed waste carriers, you can be sure all your waste will be properly disposed of. We are ethical too, and can proudly say that 80% of all the waste we collect is either reused or recycled. In addition to all of these, before we leave we will sweep and tidy up after ourselves, making sure everything is as spotless and shipshape as can be! Talk to us today about our fast and reliable waste removal services in Stoke Newington N16! Stoke Newington in the London Borough of Hackney, known informally as Stokey by the locals, was first recorded as part of the Ossulstone hundred in the Domesday Book of 1086. It has been lightly settled for hundreds of years, and the name is derived from the Anglo-Saxon for ‘new town in the wood’. Throughout the Middle Ages and the Tudor period, it was a small village located a few miles outside the city of London. Expansion was limited throughout the 17th and 18th centuries, and the area existed mostly as a stopping point for travellers heading north and looking for a pit stop. However, as London expanded in the early 19th century, Stoke Newington was sold in parcels as land of for building purposes, and the village became gradually absorbed into London. Many large houses were build to house rich London businessmen and merchants, who could travel from Stoke Newington to the heart of town in no time at all due to the advent of railways. The area remained affluent up to the Second World War, when it was heavily bombed and in the postwar years it became home to many squatters and bohemians. Today, the area is hugely multicultural, and has undergone a degree of gentrification along with the surrounding areas of Dalston, Homerton and Canonbury. Stoke Newington has been home to a number of interesting figures over the years, including author Daniel Defoe, writer Edgar Allen Poe who attended school in the area and former mayor of London Ken Livingstone. More recently, the area has been a hotbed for music and the dramatic arts, and is the birthplace of singers Paloma Faith and Maverick Sabre, actress Barbara Windsor and comedian Alexei Sayle. http://www.hackney.gov.uk/ – Your local council website. http://www.dianeabbott.org.uk/ – Diane Abbott, your local Member of Parliament. 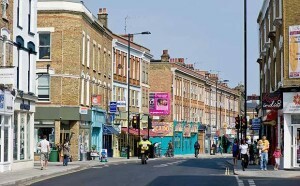 http://www.hackneygazette.co.uk/home – Local newspaper, providing news and current affairs for Stoke Newington and the surrounding area.